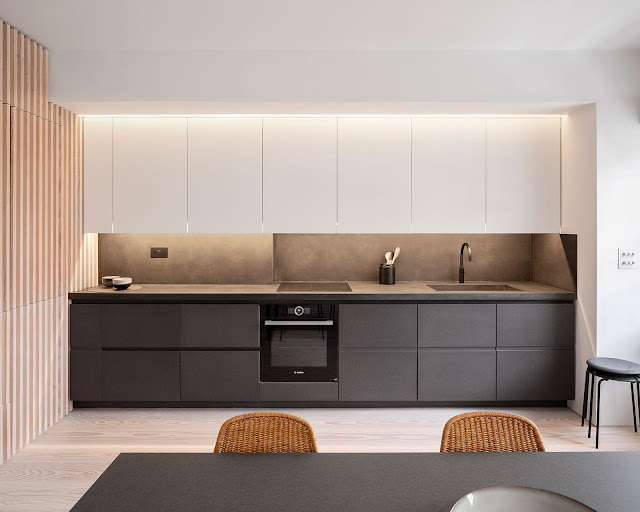 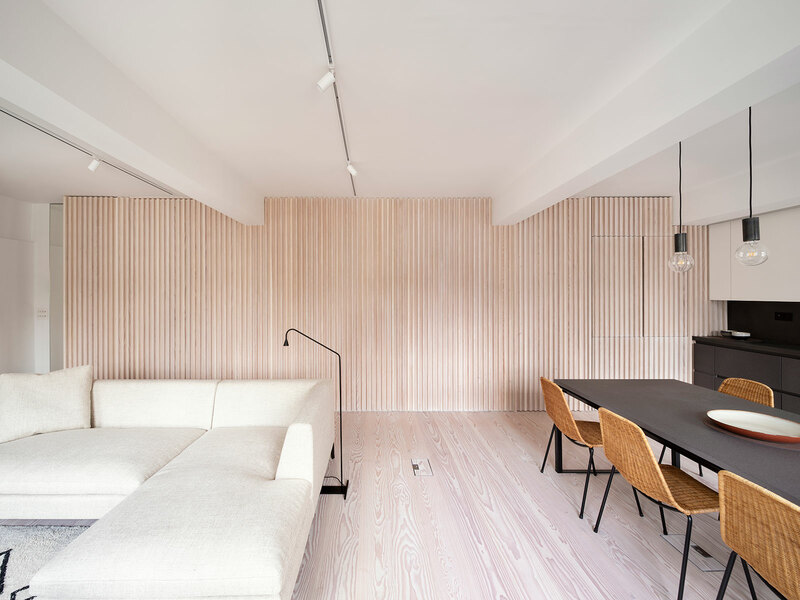 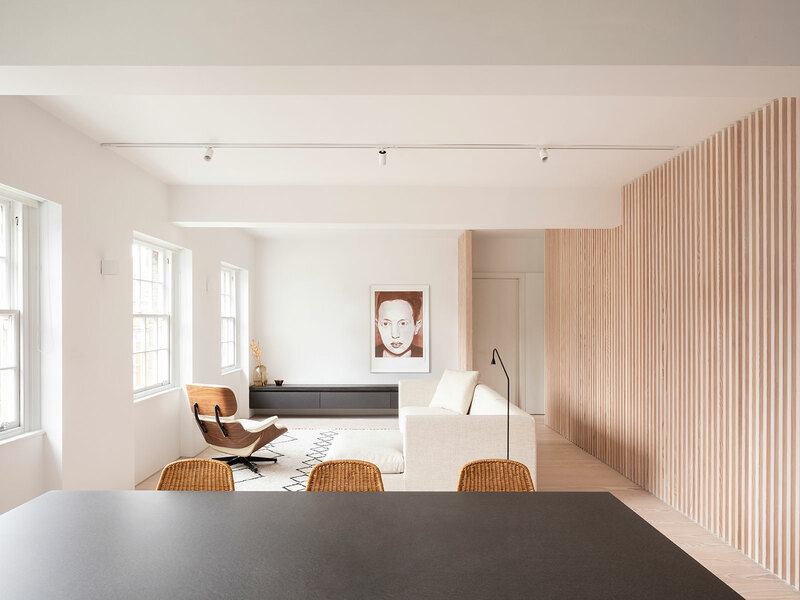 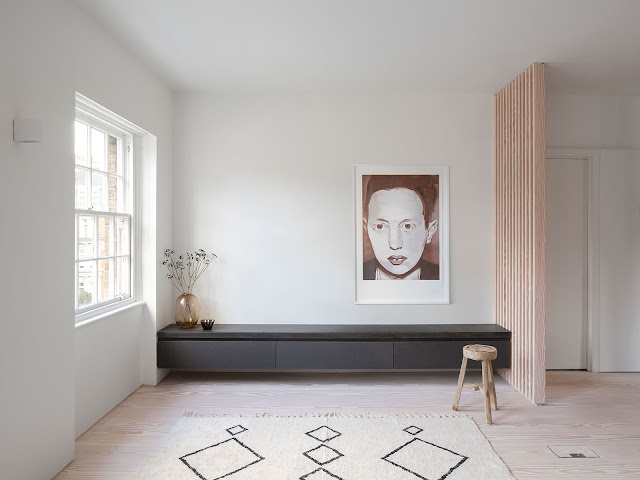 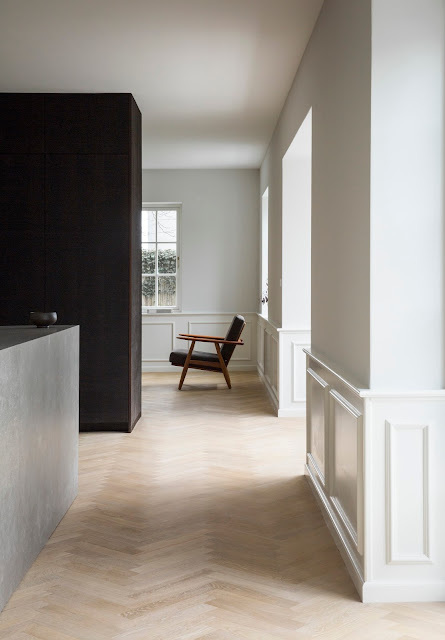 South London based architects Proctor and Shaw have completed the full interior renovation of an apartment in a period block in Marylebone, London. 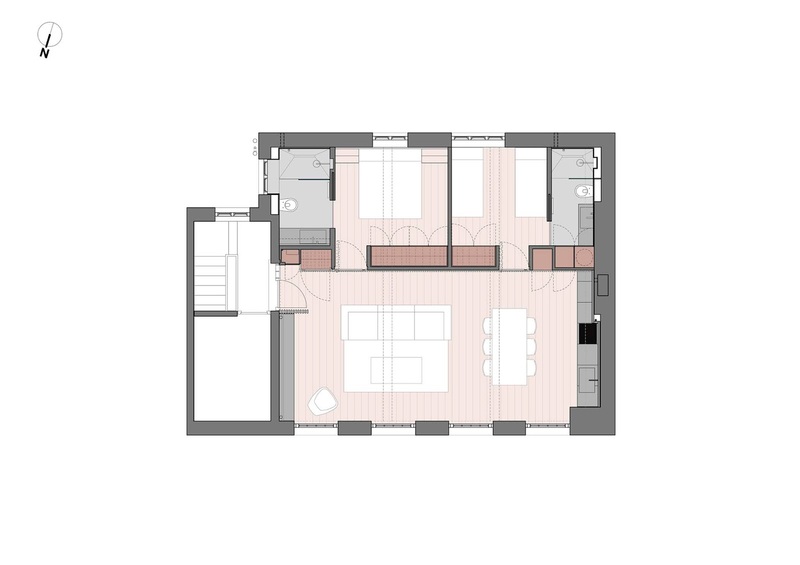 The challenging brief required re-configuring the inefficient existing one bedroom, one bathroom layout to incorporate two double bedrooms each with ensuite facilities, along with a generous open plan kitchen, dining, and living space. 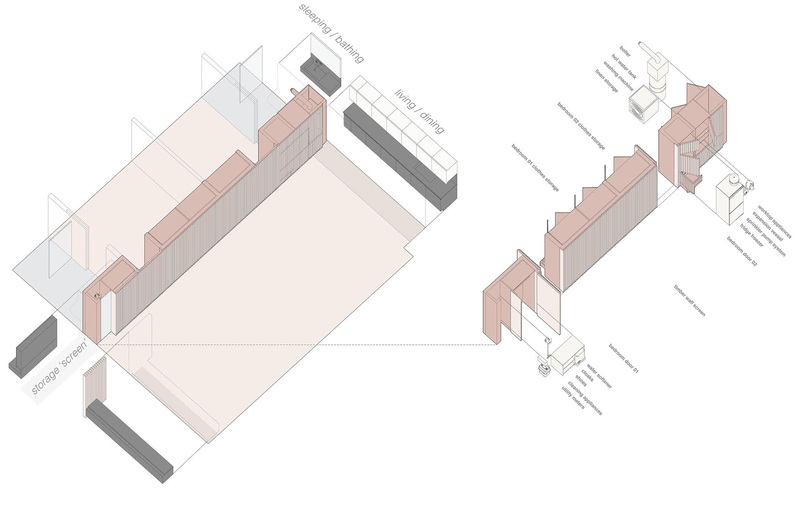 “The top floor of the existing building had been rebuilt following bomb damage during the war”, explained architect Mike Shaw, “which meant the existing spanning concrete structure allowed a complete reconfiguration of the non-load-bearing internal walls to suit the client’s aspirations for the space.” The beautiful cantilevered communal stair in terrazzo from this earlier 1950s refurbishment also set the tone for a crafted approach rich in material texture. 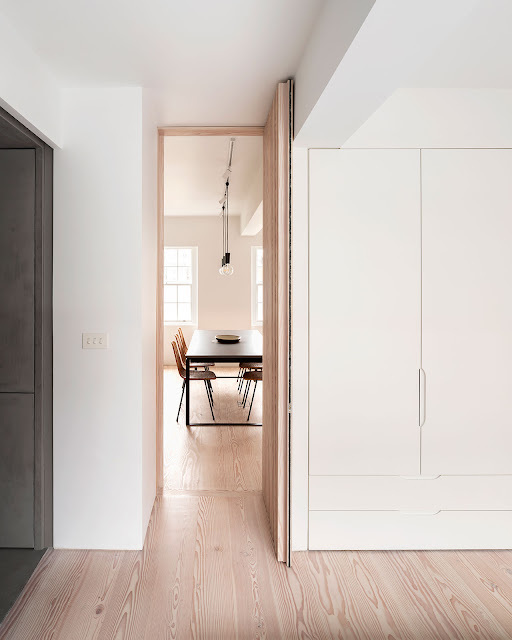 The chosen design solution incorporated a series of fixed furniture interventions that structured a newly orientated layout maximising every square inch of the property’s modest 75 msq footprint. 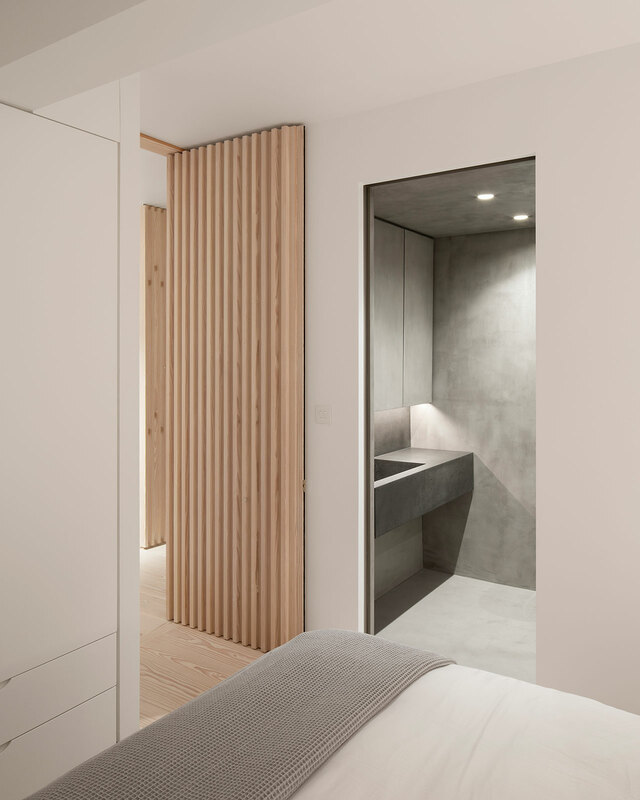 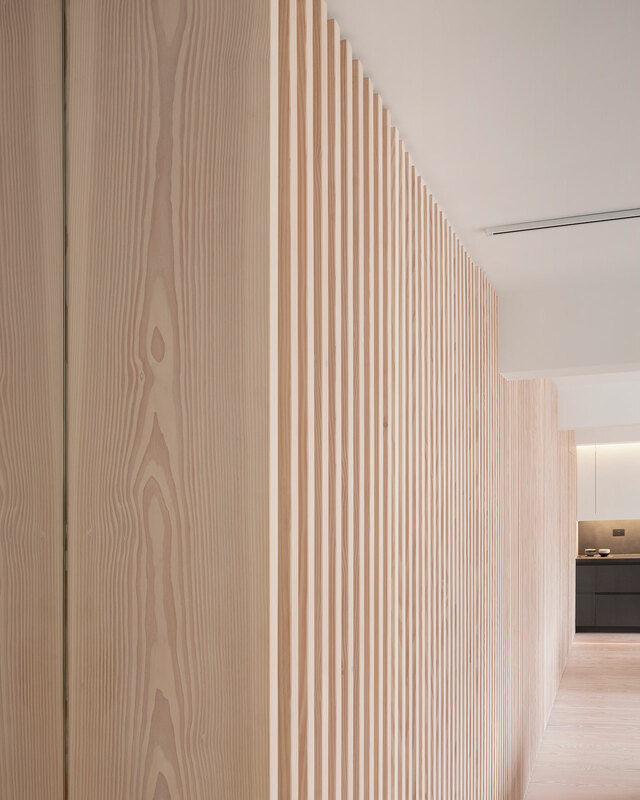 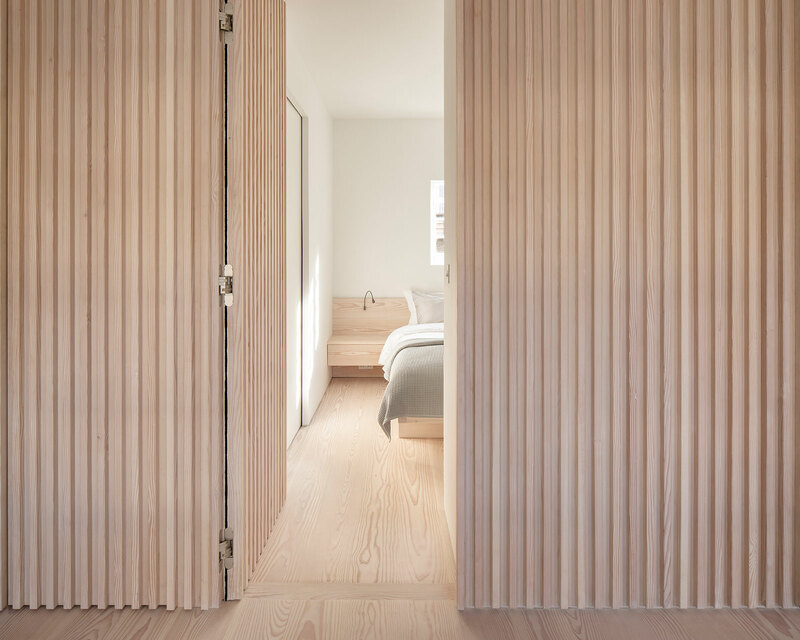 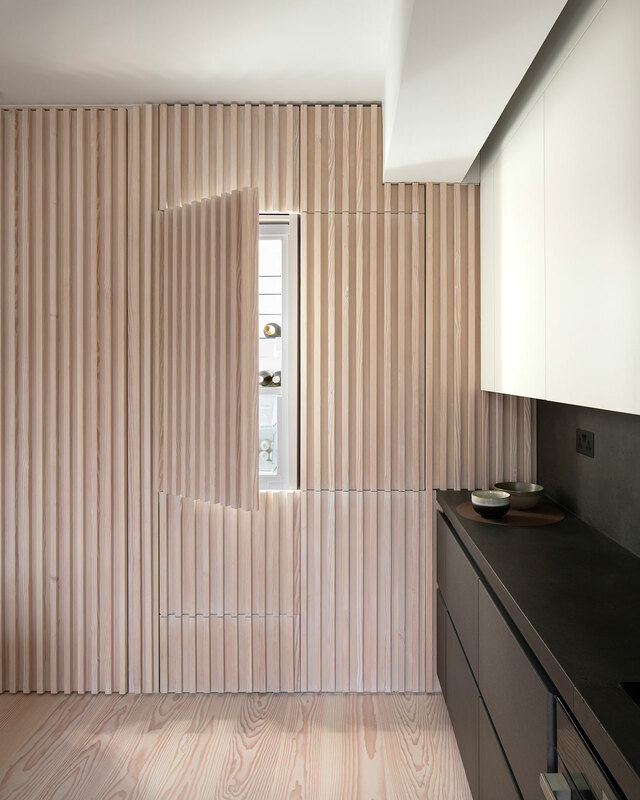 Ensuite bedrooms are organised behind a finely detailed full height timber profiled screen wall to allow a consolidated street-facing living space running the full length of the apartment. 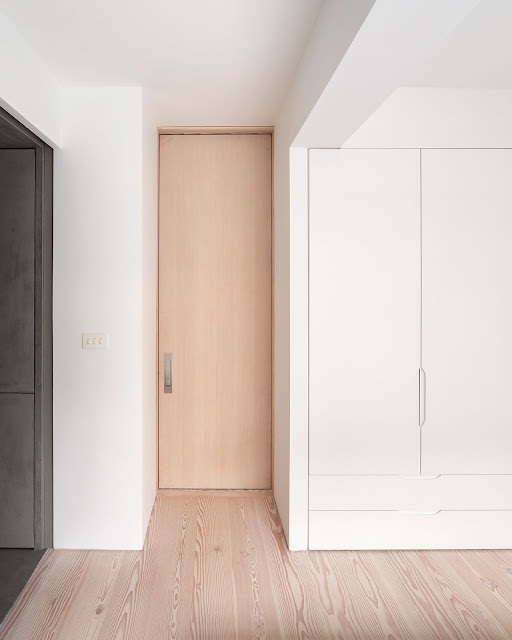 The wall incorporates all storage and service requirements for the apartment, including kitchen appliances and hanging cupboards, resulting in a highly efficient plan. 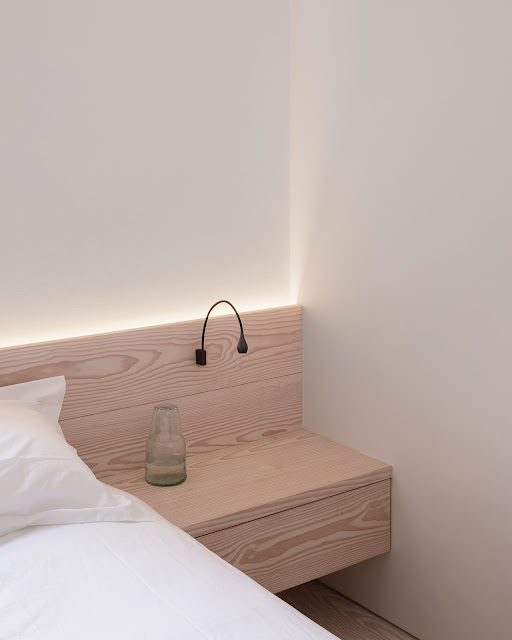 Simply finished bedrooms with flush faced built-in hanging cupboards and bespoke Douglas fir bedside cabinetry are each accompanied by ensuite shower rooms, finished in a seamless microcement finish to walls, floor, ceiling and cabinetry to create a sensuous cocoon-like atmosphere. 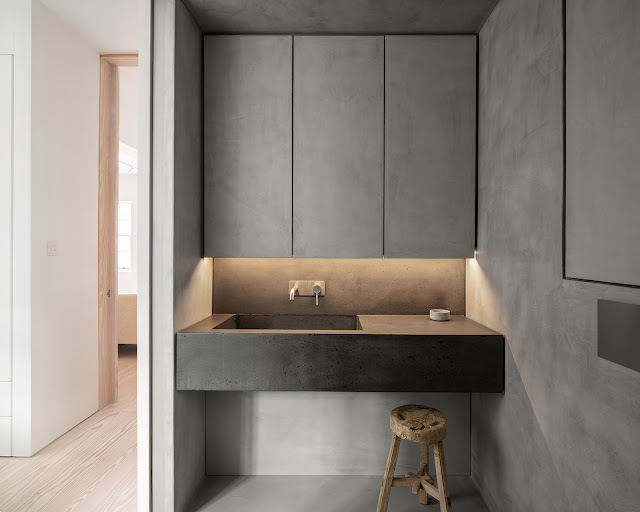 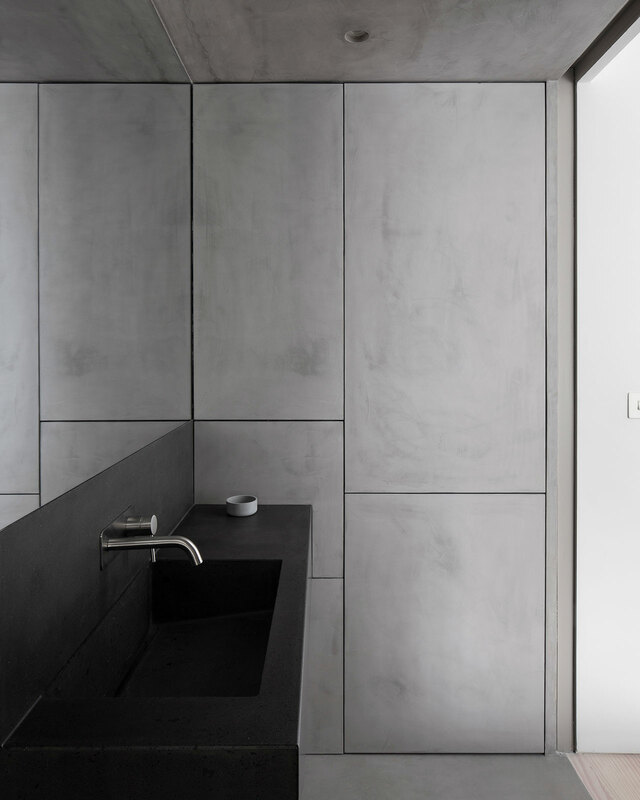 Bespoke concrete vanity units with integral sinks and brushed stainless steel fixtures feature in both spaces alongside through-coloured MDF lined cabinetry. 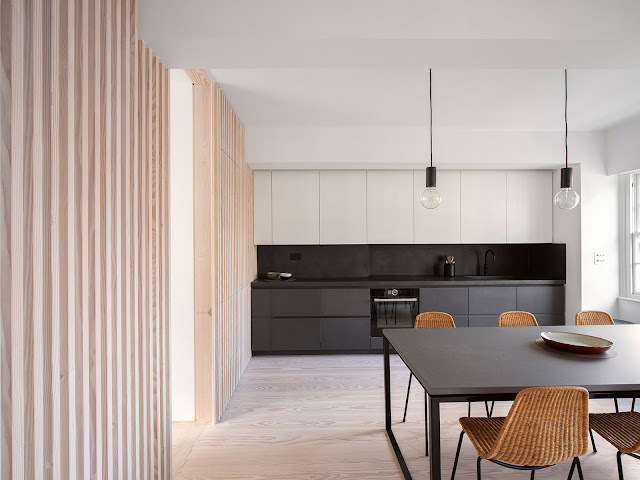 Proctor & Shaw also designed bespoke loose furniture for the space, including an eight person dining room table with a thin framed powder coated steel base finished with a matt black MDF table top to match fixed furniture cabinetry. 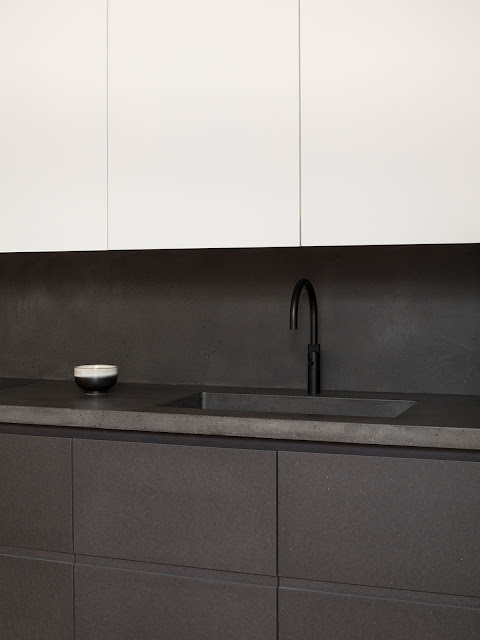 Attention to detail in the craft of the black concrete kitchen worktop is celebrated through the seamless integration of backsplash and basin, bespoke matt black finished Quooker boiler water tap, flush fitted black ceramic induction hob and colour matched flush wall sockets. 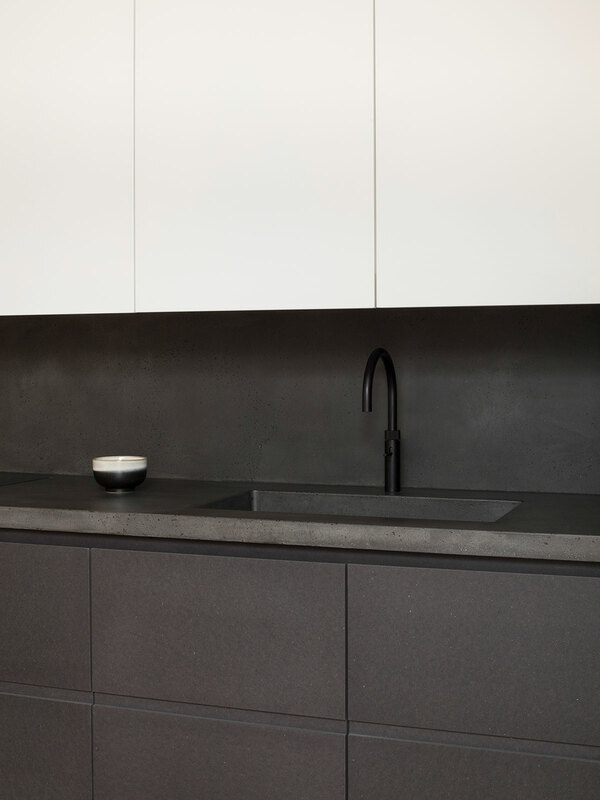 Appliances are built-in throughout, and services integrated to provide optimum performance and comfort without impacting on the visual qualities of the space.